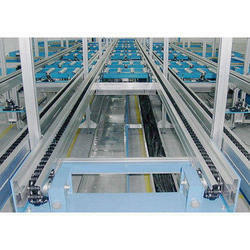 We offer the best quality Roller Conveyors, which are made using advanced technologies that ensure high performance. 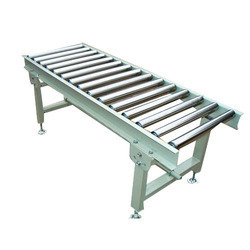 Our range of Roller Conveyors is simply designed for material transportation purpose. We are well reputed manufacturer of the same. We are pioneers in the industry offering high quality Roller Conveyor. These products are highly versatile and find wide application in airports, stations, bus stations, offices, public places, theaters and other commercial centers. Their versatile designs also make them suitable for industrial material handling applications. Material: MS/ SS304 or other Grade of Steel as per client need. - Set up in any location, right away. - Conform to virtually any layout - move stock up or down inclines, around objects. - Telescoping legs adjust at a twist of a knob. M/s Konark Industries is one of the leading designer, manufacturer & exporter of bulk flow. We are serving regularly to the solvent extraction plant. We are manufacturing the Bulk Flow / En – Mass Conveyor of various width from 250mm up to 500mm. As per required capacity for solvent extraction plant. Powerised and Unpowerised roller conveyors are designed conforming to IS-5895 & CEMA standards.Roller conveyors are line restricted devices and consist of rollers mounted between two side members. Bearings are usually incorporated in the idlers to cut down the mechanical losses.